On the farm, workers pick vegetables, collect eggs, and make cheese. At the market the next day, the workers set up their stands and prepare for shoppers to arrive. Amy, the baker at the Busy Bee Café, has a very special meal in mind-and, of course, all the farmers show up at the café to enjoy the results of their hard work. 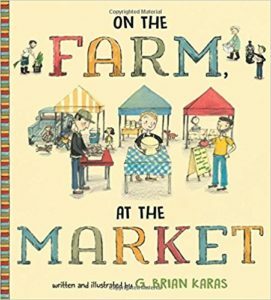 This informative book introduces children to both local and urban markets and paints a warm picture of a strong, interconnected community.